ORLANDO — Midway through this Arnold Palmer Invitational — with the Masters coming next month and three more majors and the Ryder Cup in the five months after it — let’s take a breath here to see how good this golf year already is, and how good it could be. Tiger Woods, at 42, looks like he could win on the PGA Tour again, after five years in which he seldom played and did not win. Will it be this week? Likely not. 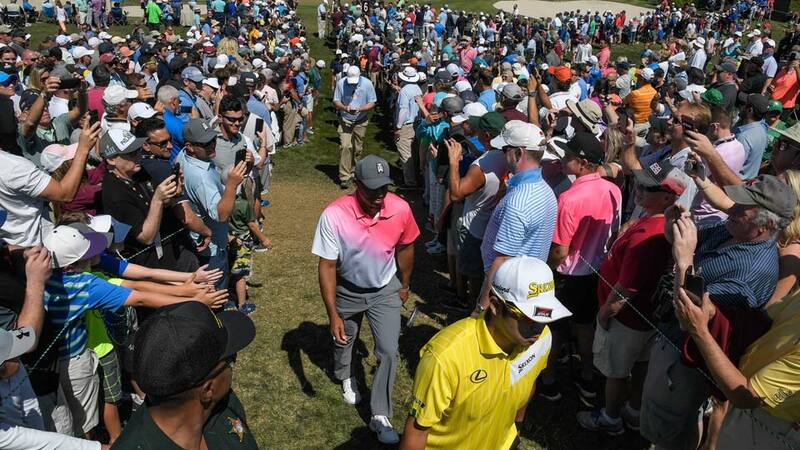 On Friday, playing the Bay Hill course in bright sunshine and past adoring crowds, he shot an even-par 72 and is trailing the two co-leaders by seven. But his golf is getting better by the week and at some point you have to think he’s going to get his 80th PGA Tour title, and maybe even his 15th major. Phil Mickelson won the Tour stop in Mexico this year. There’s no reason to think he won’t be competitive in the four 2018 majors, and there’s no reason to think he won’t be on the American Ryder Cup team in Paris in September. He’ll turn 48 on the Saturday of the U.S. Open. The way Sam Burns, who turns 22 the day after the British Open, is going, it’s conceivable that he could be on the team, too. He had a T8 finish at Honda, a T12 finish at the Valspar and through two rounds here he’s at five under par, which puts him one ahead of Woods and tied with Rory McIlory and Ernie Els and other names you’ve known for years. Do we really need surnames for the co-leaders here? If you must: H. Stenson and B. DeChambeau. Two of the most interesting and intelligent people in the game. Their golf methods could not be more different — as you will see if you watch them play together in Saturday’s last group — further proof that there is no one way to play this game. Stenson is bash, bash, bash. DeChambeau plots his way around the course. And there they are, having navigated the course over two rounds in 133 strokes. Playing from their tees, and by the actual rules of golf, any 100-shooter would do pretty well to post 133 for a single round. These guys are good at golf. The stage is set for a series of the list of career grand slam winners to grow this year. Rory McIlroy could win the Masters and complete his career grand slam. Phil Mickelson could win the U.S. Open at Shinnecock Hills and complete his career grand slam. And Jordan Spieth could win the PGA Championship and complete his career grand slam. Or — can you handle it, people? — each of those three gents could collect his missing piece of hardware and the number of players with career grand slams could go from five (Gene Sarazen, Ben Hogan, Jack Nicklaus, Gary Player and Tiger Woods) to eight! So if anyone starts telling you that this golf year is all Tiger, Tiger, Tiger, that’s just wrong. Yes, Tiger Woods finishing a shot out of first at Valspar did make the winner, Paul Casey, look like an afterthought. But the circumstances were unusual there, including the fact that Woods had never played in that tournament before. There was something approaching pandemonium on the course and the TV coverage picked up on that. Here at Bay Hill, where Woods has won eight times, the novelty of Woods back in action is not as extreme. Stenson, looking for his seventh Tour win, and DeChambeau, looking for his second, will have no trouble keeping the spectators on hand long after Woods finishes his third round. Stenson, who won the 2016 British Open with one of the most dominating performances ever, could be playing his way into the World Golf Hall of Fame. He’s been on four Ryder Cup teams and has won 20 times around the world. But he will need more PGA Tour wins, against the best players in the world, to get to St. Augustine. We’ll be watching. We’ll be watching Henrik, Bryson and young Sam Burns. We’ll be watching Rory at Augusta and Phil at the U.S. Open and Jordan at the PGA. We’ll be watching Tiger when he’s in contention and even when he’s not. He’s earned that. But he’s not the only show in town, which is good, and how it should be. Golf’s in a good place.